We've featured many college marching band proposals here on our page and all of them have been amazing in their own unique and romantic way. Well, we have another one to add to the group! This past Saturday the Arkansas Razorbacks hosted LSU in a big time matchup. While the game wasn't all that great for the Arkansas fans, this moment was definitely one they will remember for a long time. 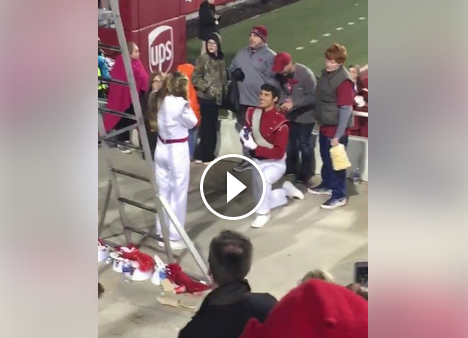 Watch as one of the drum majors of the Razorback band climbs down the ladder to find someone special waiting for her at the bottom! SOMEONE GET ME A FREAKING TISSUE!! TRUE LOVE PEOPLE, IT'S REAL!